Tetbury is one of the most beautiful Cotswold towns with its elegant buildings creating a real sense of timeless beauty, a delight for those who stumble upon this jewel of the Cotswolds. It is a thriving town built around its restored 17th century Market Hall. Situated on the outskirts of Tetbury is Chavenage House, a wonderful example of an Elizabethan Manor house. Nearby is the famous National Arboretum at Westonbirt, set in 600 acres of rolling Cotswold countryside including 17 miles of footpaths to explore. In the autumn it offers a breathtaking colour spectacular which has to be seen to be believed. A little further away is the Cotswold Water Park, the largest area of inland water in England, offering a wide range of water sports. 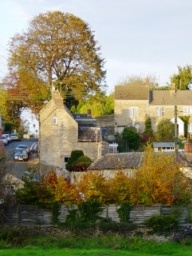 The area is excellent for walking with the Cotswold Way, Macmillan Way and Monarch's Way within easy reach. Built by Francis Hiorn between 1777 and 1781, Tetbury's Parish Church has been described by an English Heritage Building Inspector as 'the best Georgian Gothic church I have ever seen'. The spire, which was completely rebuilt in 1891, is the fourth highest in England. Extensive renovation work in 1993 has restored the interior to its original Georgian plan. 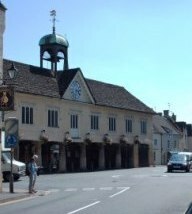 The Market House, built in 1655, is one of the centrepieces of the town. It is one of the finest examples of a Cotswold pillared market house and is still in regular use as a meeting place and market. Wednesday is market day with traditional market stalls at street level, with frequent other stalls throughout the week. The first floor oak beamed meeting hall, reached by the ancient stone steps, is of great historic interest.